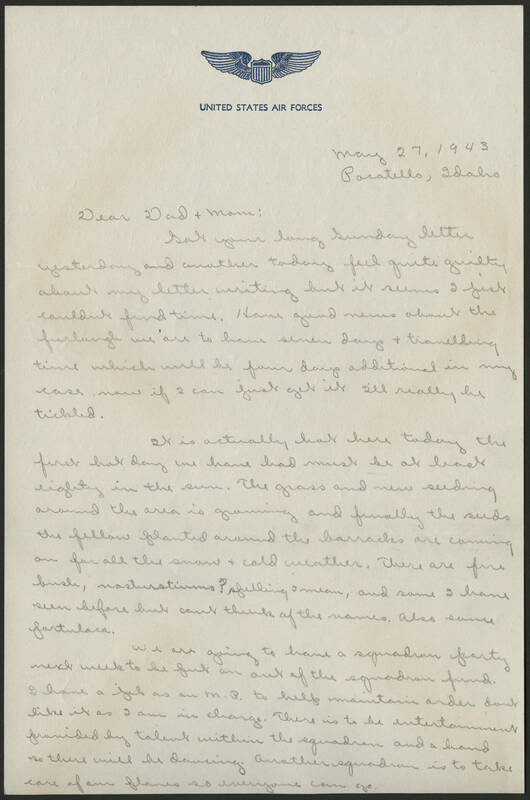 May 27, 1943 Pocatello, Idaho Dear Dad + Mom: Got your long Sunday letter yesterday and another today feel quite guilty about my letter writing but it seems I just couldn't find time. Have good [?] about the furlough we are to have seven days + travelling time which will be four days additional in my case now if I can just get it I'll really be tickled. It is actually hot here today the first hot day we have had must be at least eighty in the sun. The grass and new seeding the fellow planted around the barracks are coming on for all the snow + cold weather. There are five bush, [nasturtiums?] [spelling?] I mean, and some I have seen before but cant think of the names. Also some [portulaca?]. We are going to have a squadron party next week to be put on out of the squadron fund. I have a [?] as an M.P to help maintain order dont like it as I am in charge. There is to be entertainment provided by talent within the squadron and a band so there will be dancing. Another squadron is to take care of our planes so anyone can go.